If you’re going to have a pool in your backyard, you need to do your research on fences. Australian Standards and regulations provide explicit instructions as to the type of fence you need to have around your pool. Failure to adhere to these swimming pool fencing regulations could mean that the pool you were so excited about will have to be quickly filled in. So long as you contract a professional, reliable fencing contractor, they will be able to give you all the information you need about the relevant legal requirements. So, rather than concern yourself with the legalities, now is the time to determine what style of pool fencing it is that you want. When it comes to pool fencing, there are plenty choices out there, so it’s important you do your research. Of course, your contractor will make some suggestions but ultimately it’s about finding a pool fence that matches your vision and allows you to build the pool and backyard that you’ve always dreamed of. So, here’s a little run through by the fencing experts at Everlast Services on what you can expect from the different types of pool fencing options. This is perhaps the most popular pool fencing option on the market and for good reason. Steel fencing is cost effective, durable, safe and if designed correctly a very attractive fencing option. The beauty of steel fencing is that it requires little to no maintenance. You can give it a hose down every now and then to get rid of dirt but apart from that it’s basically a set and forget option. Great for those who want to keep costs down without sacrificing on quality and safety. Aluminium slat fencing is a real favourite amongst the Everlast Services team. The beauty of this product is that it mimics the visual of timber, whilst being a far more cost-effective and durable option. Timber fencing looks great but it is very high-maintenance, especially when subjected to the repeated splash of chlorinated water. This option gives you all the natural beauty of a timber fence except (as it is made out of aluminium), you don’t have to worry about it rotting, or needing to repaint it. This option is perfect for anyone that is looking for the reliability and ease of steel fencing but wants to add another stylistic element to their pool fence. Just keep in mind that, when using this type of fencing around a swimming pool, it needs to be installed by a professional contractor—there are strict guidelines governing the separation of the slats. 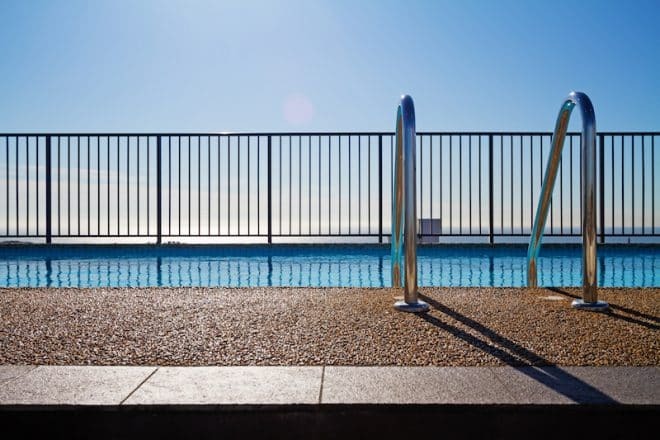 Tough, stylish, iconic and instantly recognisable, this Aussie creation continues to be the first choice for people looking for swimming pool fencing options. It’s not a great material for the entirety of your pool fence though—it will block out a lot of sunlight and obscure the view of your pool but it’s certainly a great option for one side of your fence. Colorbond lasts forever, looks great and there’s so many colours to choose from that you’re sure to find an option for your backyard design scheme. Nothing is as effortlessly stylish as glass fencing around a swimming pool so it’s no wonder that it’s one of the most popular options on the market. Glass fencing allows you to make the pool the star of the show. There’s nothing more relaxing that looking at water and, unlike other pool fencing options, glass allows you to do this whilst also ensuring your pool area is compliant. The options are endless with glass pool fencing, you can go for a frameless look so that the barrier between your pool area and the rest of your house is almost invisible or you can include interesting framing choices to add to the glamour. There’s a little bit more maintenance when it comes to glass fencing but the sheer beauty of the look more than makes up for it. Glass is often thought of as a fragile material but modern technology has made it incredibly tough and you can rely on a glass pool fence to last forever. No painting, no rust, no rotting just the perfect accompaniment to what is the centrepiece of your backyard. Every option we’ve mentioned is perfect for your pool, you can even combine a few of them to come up with a truly unique look. It’s important to remember that while a pool fence is a stylistic feature it also has to be safe. Australian children continue to drown in backyard pools every year and there is no better way to prevent this tragedy than by ensuring that you have a complaint fence.